After many days trying to learn how to use the texture editor, PAMM and Github, the mod is finally available. Thanks a lot guys! Reconverted the skybox pictures to remove the fog. The default skybox is Eagle Nebula and the folder Home contains a skybox taken near our Sun's position. There is no UI to easily switch to a different skybox so if you want to use Home, copy the files in the folder and overwrite in \textures. If someone wants to do one, he is free to do so. In the future, i (or you) plan to add more skyboxes, this is why i kept the Eagle Nebula folder while the same files are in \textures. It's not really a bug because I think it's intentional with the default PA skybox. A kind of emerald-colored fog appears when the camera is pointed to a corner of the cube. It disappears when the camera is pointed towards the middle of the face. Lines can appear at the edges of the cubes, they are mostly visible when the skybox has bridge colors. huangth, tunsel11, Alpha2546 and 16 others like this. All skyboxes are 1024*1024, it should work with all resolutions. Oh wait - you have to convert to 6 different .papa files. Damn. 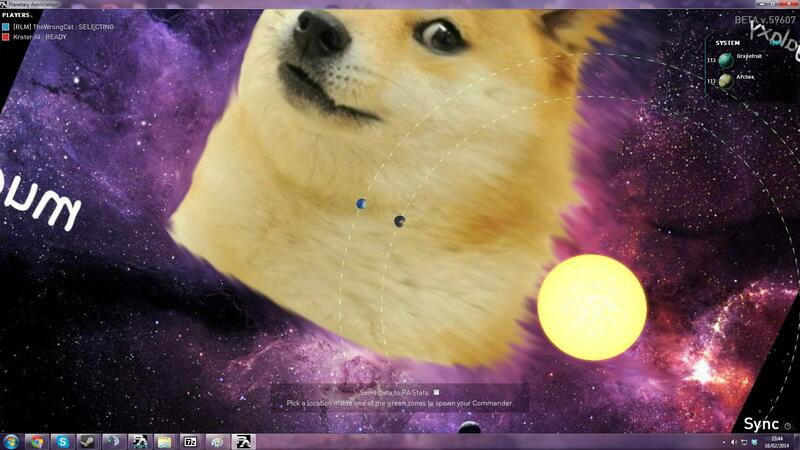 @DeathByDenim Do you have the Doge Skybox .papa files available anywhere? It is available in his papa texture editor in the CustomSkybox archive. Nevermind, I found it. Where would I go about getting the 'default' Uber skybox? LavaSnake, SXX and cptconundrum like this. You mean the actual papa files, right? There is also a "ref" papa there to show you how the cube is formed. EDIT: Oh, wait, you mean the actual png files. You can use the "Export..." menu option to get those. When trying to install is through PAMM, I get "Couldn't open ZIP file! Reason: Not a zip archive"
I've refreshed PAMM and still get it. Awesome. I'm too dumb/lazy to install this except through PAMM but soon as it works from there I'll get it. Planning to make a selection to choose from anytime? I'm not sure if the non-windows PAMM works the same, but in the windows version there's a folder called "pamm_cache" that sits at the same level as the mods folder. This will have the downloaded archive, which if you have the appropriate un-zip tool for rar, you can extract manually into the mods folder in the meantime. It does, but it's also very overzealous on keeping it clean. So the next time you start pamm, it will delete any downloaded mods it finds in there. I wonder if that is in the shaders or effects files. Maybe we can remove that glow or change its color. So I checked and it was a zip file so i'm not sure where the problem comes from.